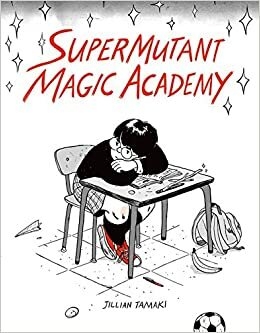 Jillian Tamaki is an author whose work I really enjoy, and her newest book, SuperMutant Magic Academy, is no exception. I didn't know a lot about this book heading into it except that it was about mutant humans going through high school. I was under the impression it would be one story with many characters involved in a big plot. That's not at all how the book is set up, though. SuperMutant Magic Academy started as a web comic, so it's written in vignettes that are usually only one page long, much like a comic strip. 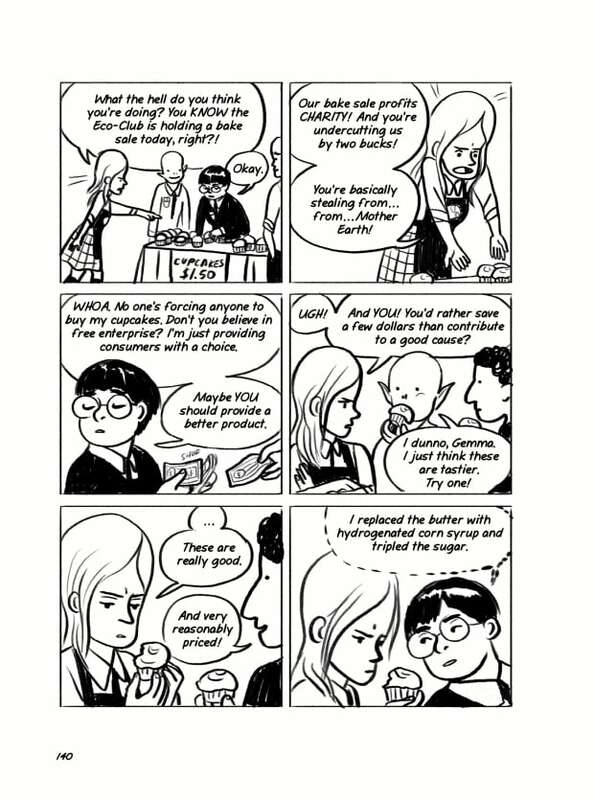 Through these, Tamaki provides funny, sweet, and realistic snapshots of high school life. The characters interact with each other in the classroom, at lunch, in their dorms, and elsewhere. So many lovely moments in so little space. What is great about this book is that you can enjoy it just as much by reading one or two pages at a time or by reading it in much bigger chunks. I would love a copy for my bookshelf; I imagine myself strolling over, picking the book up, choosing a page at random, and then smiling at the humor, poignancy and all-around wonderfulness that comes through on that page. And then I'd probably read the next page, and then the next, and continue standing there, smiling, until my legs began to complain. This book is nothing like other fantasy books set in boarding schools. In fact, it's nothing like fantasy books. It's more like Calvin & Hobbes. The characters happen to be magical, but the magic is in zero ways important to the stories that are told (except sometimes to add a dose of situational humor). Instead, what's important is a group of teenagers nearing the end of their time at high school, making and keeping friendships, understanding truths about themselves and others, learning about what is important to them, and dealing with the normal trials and tribulations of being a high schooler. The characters are usually very fun and kind to each other; I especially liked how very popular, beautiful, and good-at-everything Wendy always chastised her friends for being unkind to anyone else. She is the sort of person we all want to be friends with. 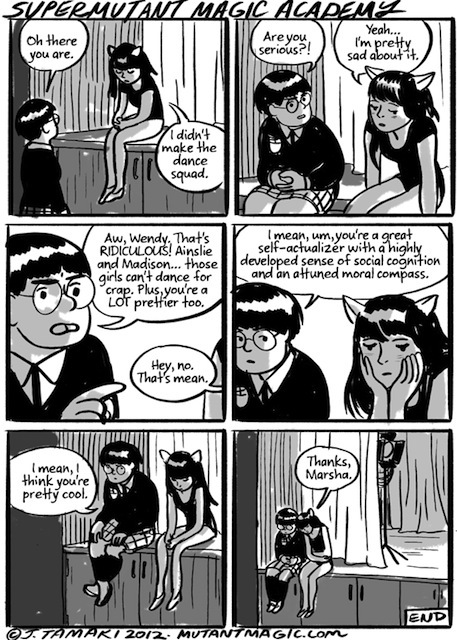 And the casual acceptance the characters have for their gay classmates is quite heartening as well. It's not a big deal. It doesn't define them. But even kind people make mistakes sometimes or can be cruel without meaning to, especially at an age when we are all so insecure and worried about our looks and what other people think of us. That comes through a lot, too, particularly with the character of Frances, the artsy girl that no one quite "gets" (even though she is dating the biggest jock at school). It's just a really lovely book. I highly recommend it! Goody goody goody! I have this out of the library as we speak and I am SO looking forward to reading it. I'm glad you liked it! It's going to be such a perfect weekend read (if I can unearth it from my library bag -- I have WAY too many books checked out right now). I didn't have much success with another Tamaki book I read but this one sounds fabulous! I will be reading it soon.